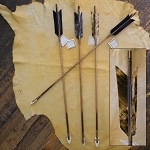 Native American artifacts are very important to their heritage. 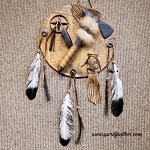 An Indian rattle may be used in tribal dances, in a ceremony, at a Powwow or in a drumming circle. 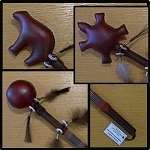 Ceremonial music often includes the use of rattles. Rattles can also be used during meditation time. 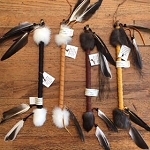 Our Cherokee rattles are made with turtle shells and our Navajo made rattles are made using rawhide, both have beadwork as adornments. Pipes are part of Native American culture. 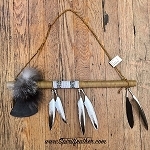 The Native American pipes we carry are fully functional pipes, but not peace pipes as they are considered sacred and should not be for sale. 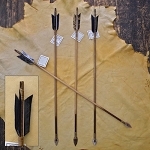 Our Native American arrows are Navajo made and come with a Certificate of Authenticity. This is just a sample of what we have, contact us and tell us what you want. Native American Indian artwork at its best.